The Manfrotto Nitrotech N8 Tripod Head features a continuously variable counterbalance system built on a nitrogen piston mechanism. Unlike heads with stepped levels of counterbalance, the Nitrotech N8 is precisely adjustable to the weight of your camera rig. With a 17.6-pound capacity, this head can support a pro-style video camera or a tricked-out DSLR / Micro Four Thirds rig. 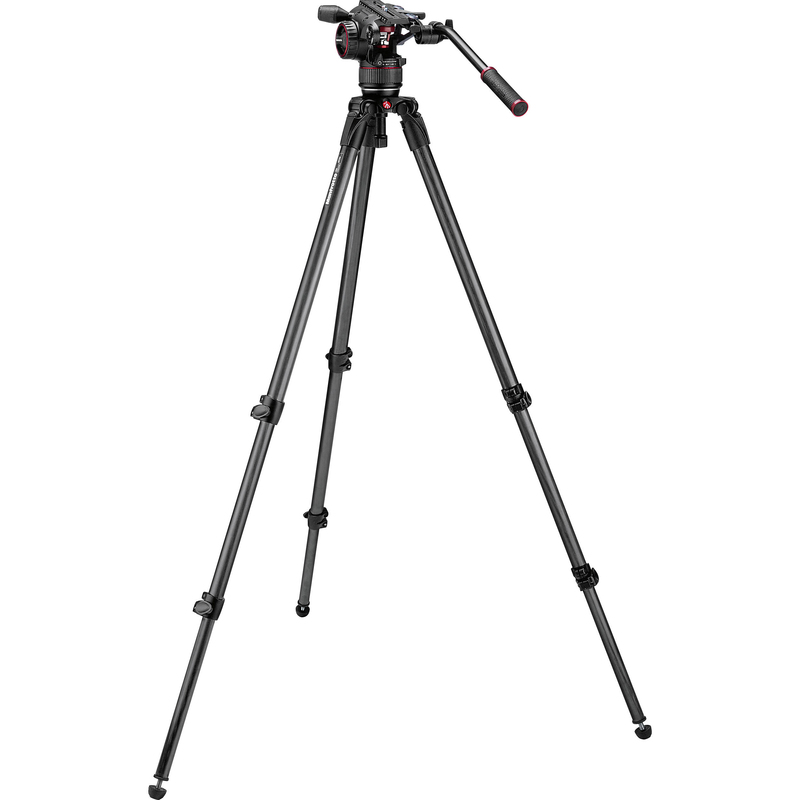 For this review, the Nitrotech N8 Head was mounted on the Manfrotto 535 Carbon Fiber Video Tripod—a two-stage tripod that has a maximum height of 67" and lowers to 11". 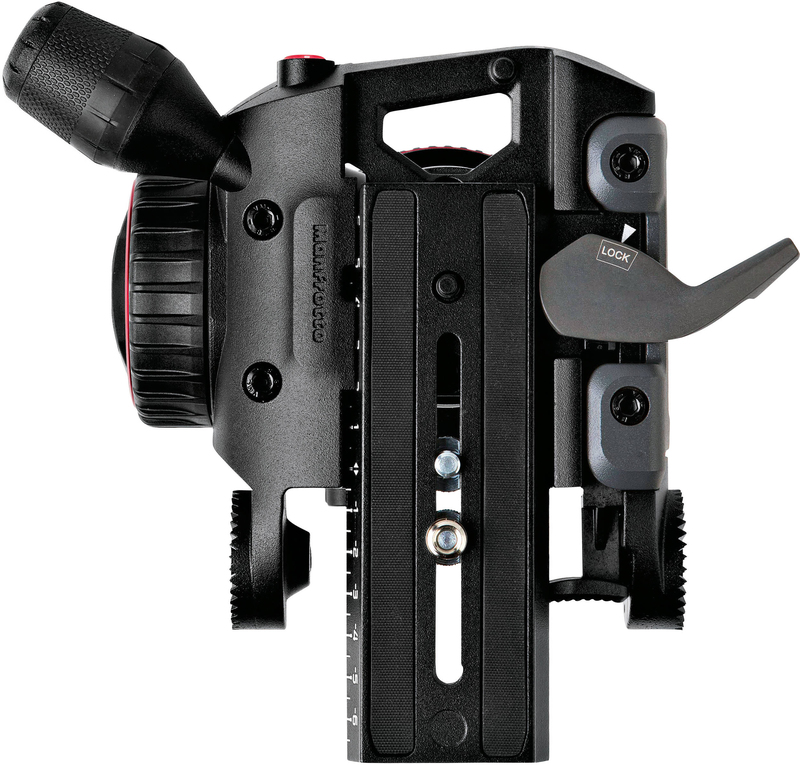 The Nitrotech N8 Tripod Head shares the open, bridge-style design of select Manfrotto heads, which reduces weight and allows for a wider top plate. 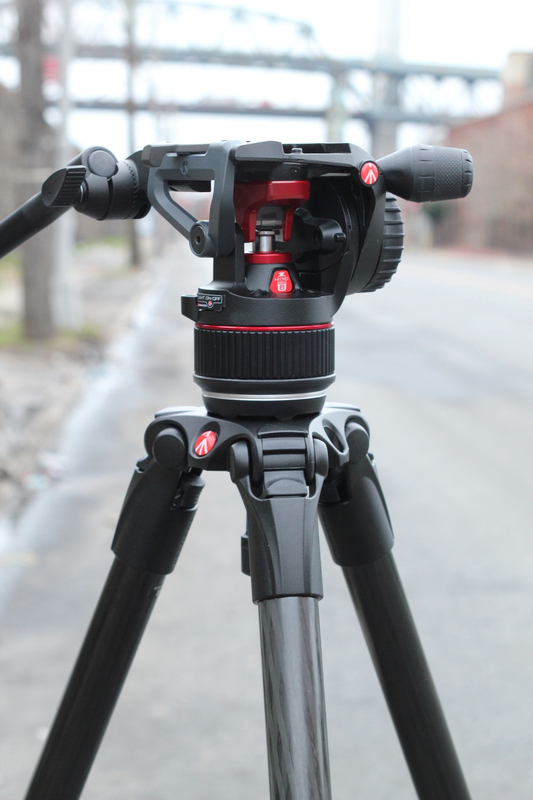 This is a 75mm flat-base head, but the kits that include the N8 head and tripod legs also include a half-ball adapter, adding versatility for mounting on dollies, sliders, and other bases. Weighing slightly less than five pounds, this aluminum head is about six inches high. To test the counterbalance system, I started with a Blackmagic Pocket Cinema Camera in a Tilta Cage with rods, and a Panasonic Lumix 14-140mm lens, then built on a Tilta follow focus, and a Redrock Micro matte box in turn, adjusting the balance as I went. As is often the case with smaller-form camera rigs, the matte box and follow focus are each a significant addition to the weight of the camera rig. With the N8, I could neatly adjust the counterbalance for the additional weight of each item. The counterbalance knob itself is nicely sized with an easy-to-grasp, rubberized surface. An arrow indicates the twisting direction for increasing and decreasing. You can see the nitrogen piston rising and falling with the corresponding turns of the knob. The nitrogen piston itself is solidly constructed and has an industrial-chic design. Its open design wouldn’t seem to lend itself to use on your beach volleyball shoots, though. 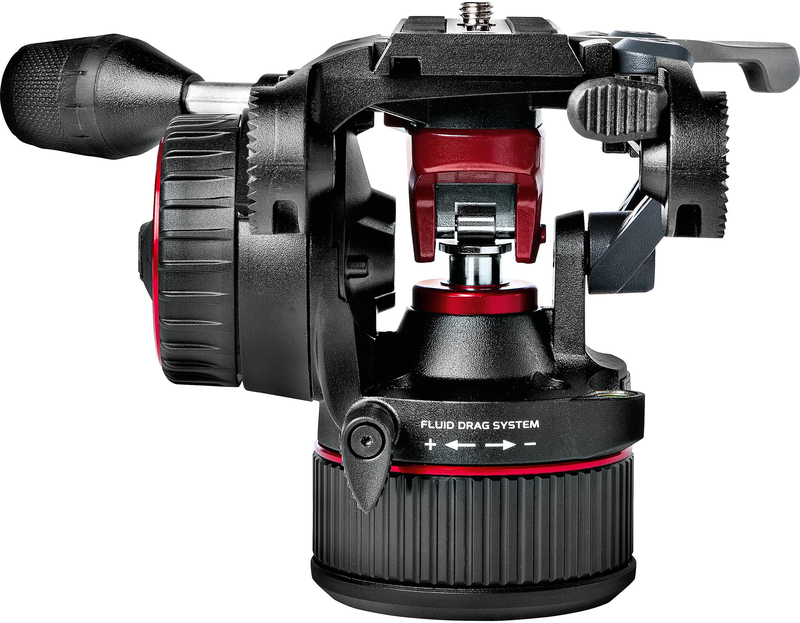 Unlike some Manfrotto models, the tilt and the counterbalance controls are on the left-hand side of the head, leaving your right hand free to maneuver the pan bar, and if you’re using one, a zoom control. When adjusting the tilt drag dial, I found it more comfortable to keep my fingers toward the bottom of the dial. If you find your fingertips are bumping against the counterbalance knob, you can extend the knob by simply pulling it outward from the head. 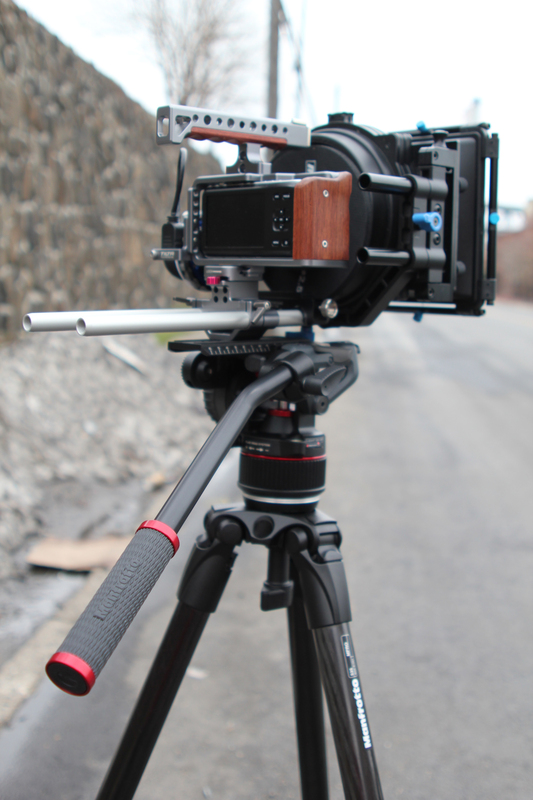 The knob extension would also be handy when working with a wider camera rig. Many shooters like to be able to lock and unlock controls, and otherwise operate a tripod head without having to take one’s eye from the viewfinder. As on many video heads, the drag fluid adjustment on the N8 is controlled by a dial. Rather than having the common lever-type lock, though, the outer rim of the tilt drag dial functions as the tilt lock. Just keep turning the ring forward until the head locks in place. The N8’s large, ridged dial proved to be easy to turn and comfortable to grip without having to fumble for it. I did find it a little disconcerting that the counterbalance knob and the tilt drag / lock dials rotate in opposite directions when increasing their respective functions. The counterbalance twists clockwise when adding resistance, while the tilt drag and lock rotate counter-clockwise to increase. Some users may prefer this design if it helps them to differentiate between the two functions. The N8 head’s camera-mounting plate has a push-button safety release and a lever-type lock. Releasing the two simultaneously, with one hand, took a little practice but was not difficult. The plate is not reversible, but the front end is marked for easier alignment. Sloped edges at the front aid in lining up the front of the plate with the head, and safety stops prevent the plate from sliding off in either the forward or reverse direction. It comes with a ¼"-20 mounting screw, and 3/8"-16 bushings are included. A handy feature is the cutout where you can add the anti-twist pin when mounting a camera that can accommodate one. An engraved numerical scale on the side of this sliding plate enables you to note where the plate is optimally positioned for your camera. The plate’s elongated design, with two anti-slip rubber strips, fastens securely to the bottom of a base plate or camera. The head/tripod carrying bag has a wide strap with rubberized surface—this bag will not be slipping off your shoulder. A hook-and-loop fastener strap is anchored inside the bag; you can wrap this around the legs to secure the tripod within the bag. The bag’s zipper opens with one tab; a dual zipper would add a touch more convenience but this is a minor drawback. The bag has a handy zippered interior pouch where I found myself instinctively storing the camera plate when I put the tripod away in the bag. Considering the relatively light weight of the Nitrotech N8, it did a fine job of supporting various weights and of enabling the adjustment of the counterbalance accordingly. Its solid construction and smooth pan and tilt functions make it an attractive choice for your light to mid-weight field-style video camera or DSLR/MFT rig.